← Life is all a Work in Progress…. Here’s some of mine. May has been one of those months where you feel like you are getting everything and nothing done all at the same time. 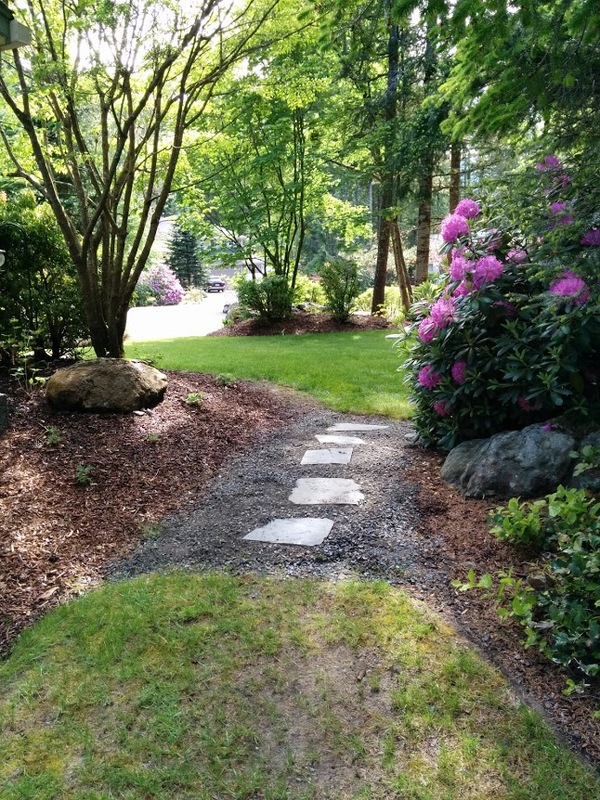 I have completed a lovely shawl I am saving for a later update, worked a bit on another shawl that is a gift (no update yet), started yet another pair of socks, and even did a wee bit of gardening, such as adding my flagstones to my side yard path. My porch is just to the left. I’ve spent a wee bit of time out there enjoying the flowers while knitting a bit this month too. 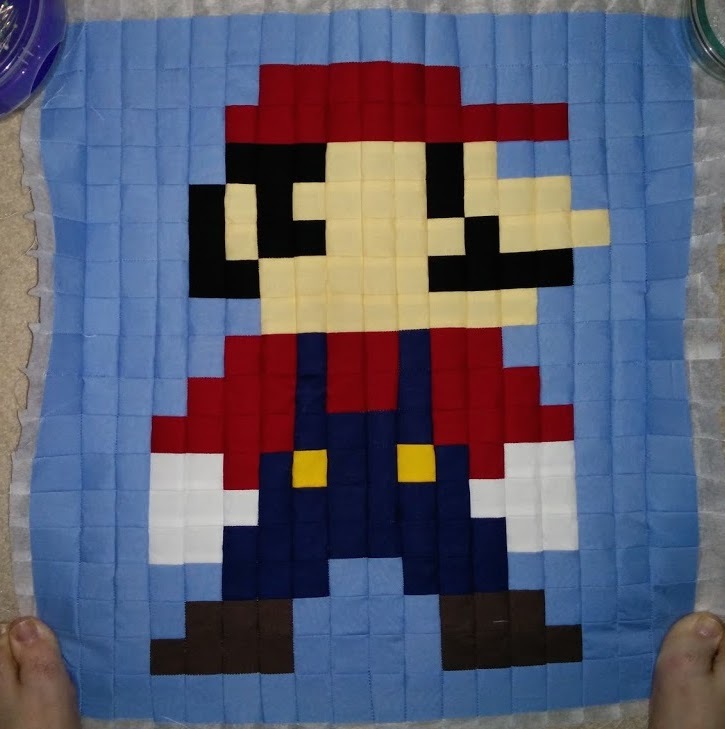 And so yesterday I finally got around to working on my Quilt-Along Mario Block… so I doubled down and did two. (Also because when reviewing my plans at the end of last month I realized I might actually want to do more than 12 blocks. I finally got around to Mario. 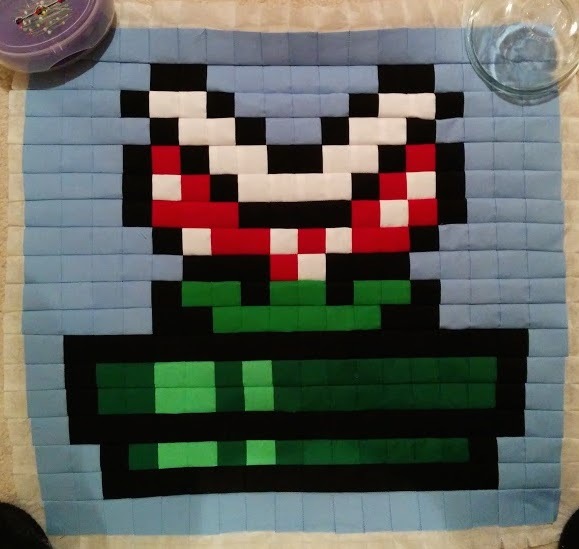 My Mario was actually done in two pieces because the 820 Quilter’s Grid is wide enough that you can get one and a half blocks per section. Since I only bought 10 yards at the start, I decided it was time to see how difficult it will be to work out the extra squares or if I would need to buy more interfacing. And it looks like it came out ok. I also tackled a Piranha Plant! This is a version from the QAL group and replaces the bare warp pipe in the original Quilt design set. btw, both of the blues in the above squares are the same, its just a matter of lighting and cell phone photos.